Any time a scout performs money-making activities for the troop, the total proceeds, when received, will be split 50% to the troop general fund, and 50% to the scout accounts of the participants based upon time worked. Exceptions to this policy is the Conner Prairie Wagon Pull and Scout popcorn sales where 100% of the money eanred will be distributed to the participating scouts’ accounts. When a scout resigns from the troop the money in their scout account will be forfeited to the troop general fund, unless they request it to be moved to another scout’s account or transfer it to another BSA organization of which they are a member. A scout may use the funds in their scout account for any scouting related expense. It will be up to the adult in charge of an activity to notify the Treasurer to debit the scout accounts for any money used for the activity. Examples of scouting related expenses are: outing fees, food costs, rechartering fees, summer camps, uniforms, and equipment. This is not intended to be an all-inclusive list, but only examples. For Troop 109, the full Class A includes the shirt and a neckerchief and slide (belt and hat are optional). The Full Class A is to be worn for Scoutmaster conferences, Boards of Review and Courts of Honor. The Class A shirt must be worn when traveling on outings. Eagle scouts are expected to wear a full scout uniform (Shirt, neckerchief and slide, merit badge sash, belt, pants and socks) for all eagle rank activities. This includes scoutmaster conference, local board of review, eagle board of review and all courts of honor. Class A or Class B uniforms will be worn at all other scout activities unless otherwise announced. Generally, benefit the community, except when performed for a Boy Scout camp. Annual troop service projects include: Adopt-a-Road, Scouting For Food, White River Clean Up, and Eagle class projects. The Fishers Festival overnight does not qualify because the troop is compensated for the work. A maximum of two hours of service will be accepted for each summer camp and Troop outing. In order to be accepted for rank advancement, all service hours must be approved in advance by the Scoutmaster or the Advancement Chair. Troop service projects (e.g. Adopt-A-Road, Scouting for Food, Luminaries, Eagle Projects) will be automatically approved since they are a part of the troop’s program. The program is approved by the Troop Committee. This policy applies to youth only. These restrictions are intended to maintain the youth focus on scouting activities. No electronic devices are permitted in the Troop meetings or outings. Board and card games are allowed but no gambling. For any outing involving travel of more than 2 hours, the leadership may allow the use of electronic devices in vehicles during travel. Scouts may only carry folding pocket knives that are consistent with the national BSA policy as stated in the Guide to Safe Scouting. Continuous safe handling and use of all woods tools, and other equipment in the troop is a condition and co-requisite for their possession and use. Scouts may only carry pocketknives that meet the legal requirements of the State of Indiana. Furthermore, if the scout is traveling with the Troop, representing the troop, or while wearing any uniform or attire identifying the troop or the youth’s affiliation with the troop, the pocketknife must meet the legal restrictions in the jurisdictions into which the scout will be traveling. Commercial travel may require knives to be shipped or placed in checked luggage. Care must be taken to ensure the safe and legal conveyance of knives and other tools or equipment. Knifes blades are limited to less than 6 inches. Flip or Butterfly knives and Boot knives are specifically prohibited. Only scouts who have a valid “Toten Chip” with them may carry a knife on them, except scouts may be allowed to carry pocketknives with them to planned “Toten Chip” trainings. When a pocket knife is being carried without a “Toten Chip” (such as on way to camp where the scout will be working on earning the “Toten Chip”; the scout must carry the knife in their backpack or luggage during travel and notify the Scoutmaster, acting scoutmaster, or patrol assistant scoutmaster or event coordinator (or a designee) that they have the knife with them. Such notifications should be made in advance to the greatest extent possible. The scout should not carry the knife with them for extended periods of time and may not use the knife outside the training until the “Toten Chip” has been awarded to them. When not in route to class, in class or returning to the campsite, the scout should have an adult leader hold the knife for them, or properly store (or stow) the knife. Knives may not be open or used in any moving vehicle or in any other situation where there may be sudden or unexpected movement or approach by the scout or by other people. Knives should generally be used in an “ax yard”. Knives must be handled with the safety, care, and etiquette as stated in the BSA Handbook. Knives must have a blade length consistent with the scout’s skill level and with the purpose for which it is being carried. Should a situation require the use of a knife outside the ax yard or outside the policy and provisions of the BSA Handbook, the Guide to Safe Scouting, and the Policies of Troop 109, the knife should be opened and used by an adult leader where possible, otherwise, by a senior scout (over 14 years of age and having achieved at least Star or Life Scout rank). An adult may confiscate a knife when any of the following situations occur: Any horseplay with the knife; improper use of the knife; threats regarding or including the use of a knife (either shown, referred to, or the use of a weapon is reasonably perceived, or where there is any violence demonstration or threat or use of violence where the threat of violence is explicit or implied. Scouts may be allowed to carry and use fishing, fillet, hunting, diving or other special purpose knives when and where appropriate by special authorization. Only registered and trained scouters serving in the capacities as scoutmaster, acting scoutmaster (for a specific outing or event), “Outdoor Program” chair, instructor (over 21 years of age), merit badge counselor, the specific event’s coordinator, or the troop committee may authorize the use of special purpose knives or variances from the policies of Troop 109, but no variances are permitted from National BSA Policy or which conflict with the laws or regulations of the State of Indiana or other national, state, or local jurisdiction. The troop will fund the registration fee for 2 scouts for each White Stag session. If more than 2 scouts wish to attend any one session, the total value of 2 registrations will be evenly divided between all scouts attending. This is open to all boys (Scoutmaster approval is required) meeting the requirements of White Stag participation, which is currently being at least 13 years of age, having First Class rank or higher, and holding an Eagle-required leadership position within the last year. The scout will be notified that they are expected to complete all the requirements of the course. Each year the troop usually pays the registration fee for a number of adult leaders attending summer camp as a thank you for volunteering to provide adult leadership for the week. This cost is split among the boys attending and added to their registration costs. The registration fees for active, registered adults will be paid by the troop. Active means participates regularly with meetings, outings and activities. Soda pop is not allowed unless provided by the adult leadership (Leftovers from Fishers Festival). Drinks purchased in individual serving containers are discouraged. Scouts are expected to buy drinks in bulk containers and use their personal cups/glasses for consumption. This minimizes the trash and mess generated in the campsite. Each scout is responsible for his own personal mess kit. This includes a plate, cup, bowl, spoon, fork and knife that is used to eat with. 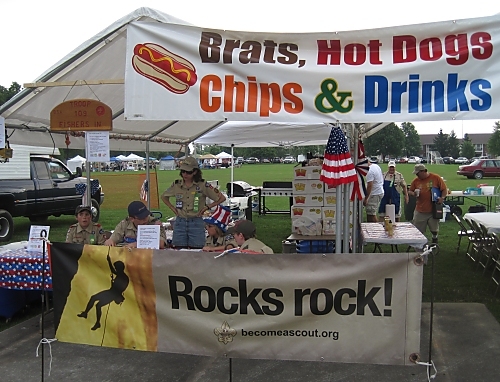 The troop will provide the equipment needed to prepare and cook food. Scouts will be charged for the direct charges associated with each outing. This includes fees associated with camping, activities and food.